Our PVQA guild member Mickey Beebe, designer of the world famous BB Bag, is coordinating our opportunity quilt for 2014. 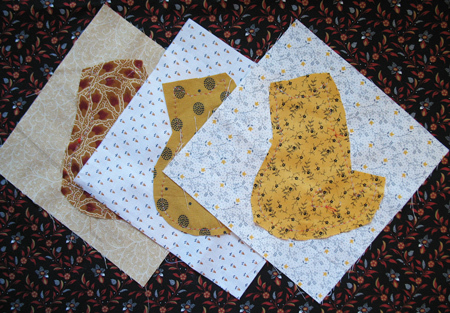 At our last guild meeting she doled out dozens of a cute little cat block that she had designed to those members not afraid of hand appliqué. I took three. Mickey had already traced the cats with a silver pencil and had provided a measurement-based placement system. I put on my thinking cap and came up with a method that slops into back-basting, except that it’s front-basting! That’s why I call them hybrid cats. I positioned the cats on the background as directed, pinned in a couple places, then front-basted along the silver marked line. Take out the pins, and voilà! it’s ready to stitch, just as if I had used my favorite back-basting method. 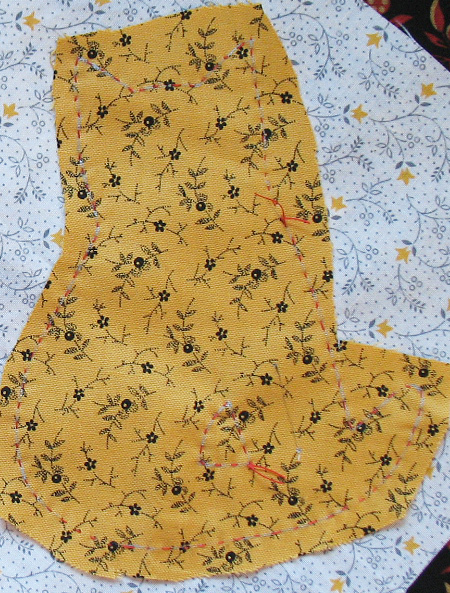 Trimmed to shape, leaving the turning allowance, and a little reverse appliqué to delineate the legs. Stitching away, removing the basting a little ahead. Three cats all done and ready to go back to Mickey! I feel like there are more in my future, since there are a whole lotta cats in Mickey’s quilt! Cat block is © Mickey Beebe. Mickey is a natural-born quiltmaking soul. You can see two of her Road to California ribbon-winning quilts, #6711 and #6712, at the R2CA site. When I looked at the webpage I was tickled to see one of my quilts on there too! We had a good year! If you didn’t win a copy of Quiltmaker’s 100 Blocks, Volume 5 in last week’s blog hop, I now have it available on my website, on the Patterns page. Also, if you can’t wait until the Book-A-Round June 7-16 to see if you win one, you can order your signed copy of Scrap-Appliqué Playground now! It’s on the Bookshop page. 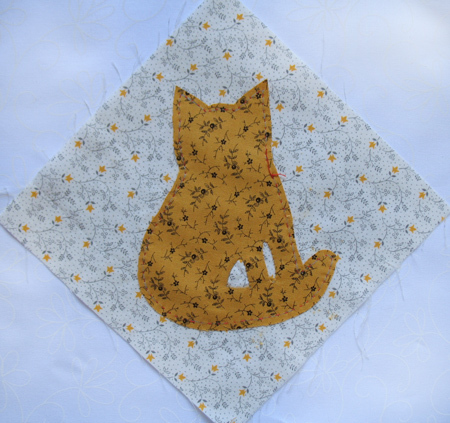 Wonderful kitties, I have used similar versions in a lot of my quilts, fun design to do. what ever works for applique! they turned out just perfect. 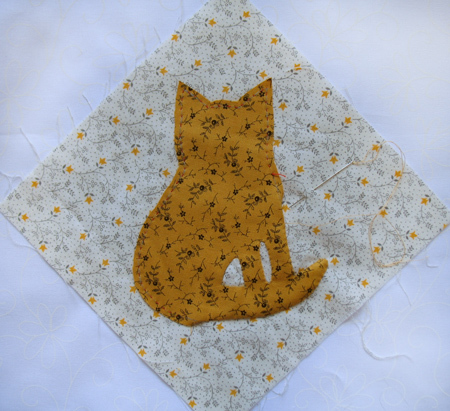 Where do I find your cute little applique cat pattern. ? Have not done any quilting in well over a year as I seem to have been suffering a burn out after years and years of quilting. But you have sparked an interest again with these cute little kitties.